Len has discovered a new product that is so amazing and in high demand, you almost have to see it to believe it – it’s that good. Imagine, have you ever watched someone trying to hold a log in one hand and swinging down with a sharp axe with the other hand…ouch…never a good idea. 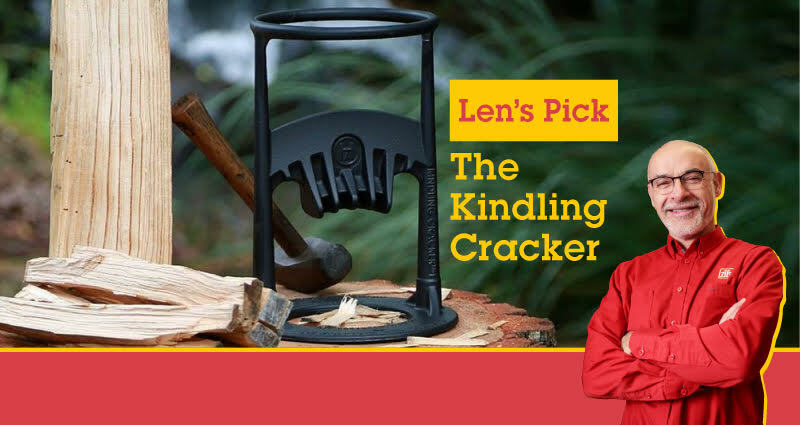 Len’s “Pick-of-the-Month” is the “Revolutionary Award-Winning Invention” from New Zealand – “The Kindling Cracker” – the safest, easiest and quickest way to split Logs and kindling for any safely contained wood fire. This includes a pizza oven, chip heater, brazier, fireplace or any fire-pit at a camp site, cottage or cabin. Now you can easily start those indoor or outdoor fires safely and naturally. Anywhere the “Kindling Cracker” has been made available to purchase, they have sold out within hours or just a day or two. Made from Cast iron and imported from the foundry in Australia – the “Kindling Cracker is virtually maintenance free and will last for years. This amazing invention - created by Ayla Hutchinson, a 17-year old young lady from New Zealand, has now won numerous “Outstanding Invention Awards.” The design is so efficient and creatively simple, you’ll wonder why you didn’t think of it first. Here’s your amazing offer from Len’s New Pick-of-the Month. The Kindling Cracker every-day pricing is $130 to $145 or more. But and only until quantities last, Len is making these fantastic units available for $99 - first come, first served. There really is no time to lose – if you wait – you could be disappointed – because they’ll all be gone. The “King of Kindling” is now available in limited quantities at Pollocks Home Hardware – your neighborhood hardware store in the GTA. Give Len a call at 416-535-1169 or visit Pollocks at 347 Roncesvalles Ave. and get your Kindling Cracker while supplies last.